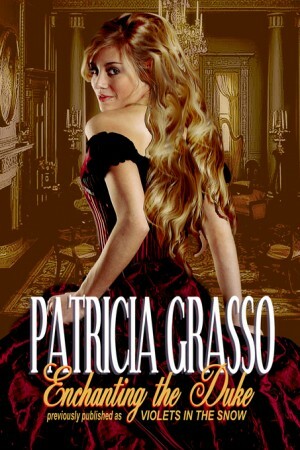 Today’s Sneak Peek is Enchanting the Duke by Patricia Grasso. As she walked into the garden, Isabelle spied a solitary figure sitting on a stone bench. She smiled, recognizing her old friend, and then advanced on her. “Are you here too?” Isabelle said by way of a greeting. Isabelle nodded and sat on the bench beside her. She lifted her flute to her lips and poured all of her feelings into the instrument. They played a song of infinite beauty, the notes first eerie and lilting, then haunting and reflective. The melody was a soothing bath of sound, reminiscent of a moonlit stroll, rustling leaves, echoing owls calling to each other in the night. “I’ll see you inside.” Giselle vanished in an instant. “Yes, Your Grace.” Was she forbidden a few moments of privacy? When the duke stood in front of her, Isabelle tilted her head back to gaze up the long length of him. Had he heard Giselle’s flute? How could that be? No one but she had ever heard the old woman. “Suit yourself, Your Grace.” Isabelle slid over to make room for him. He sat down beside her, so close his thigh teased the side of her cloak. Glancing down at the close proximity of their bodies, Isabelle felt her cheeks heat with embarrassment and sent up a silent prayer of thanks that the night hid her discomfort. “I thought I saw someone sitting with you,” John said, slanting a sidelong glance at her. Isabelle stared at him in surprise. Had he seen Giselle? Only she had ever seen the old woman. What did this mean? “Really, Your Grace, this conversation is ridiculous,” Isabelle said, trying to steer him away from the subject. “You are correct.” He stared straight ahead. A heavy silence descended upon them. Isabelle decided the silence between them was even more uncomfortable than his probing questions. “Even henwits can create problems in society,” John warned, turning his head to look at her, which made her even more uncomfortable than enduring the silence. “Henwits are the worst purveyors of gossip. “You could be correct about that.” Isabelle tore her gaze away from his. Lord, but those midnight-black eyes seemed to see to the very depths of her insecure soul. Like what you’ve read so far? You can purchase Enchanting the Duke at Lachesis Publishing or on amazon, BN nook, or kobo.